To go along with my popular Poetry Slam product, I created student templates to use for the final copy. I have several ideas for this cute little booklet. 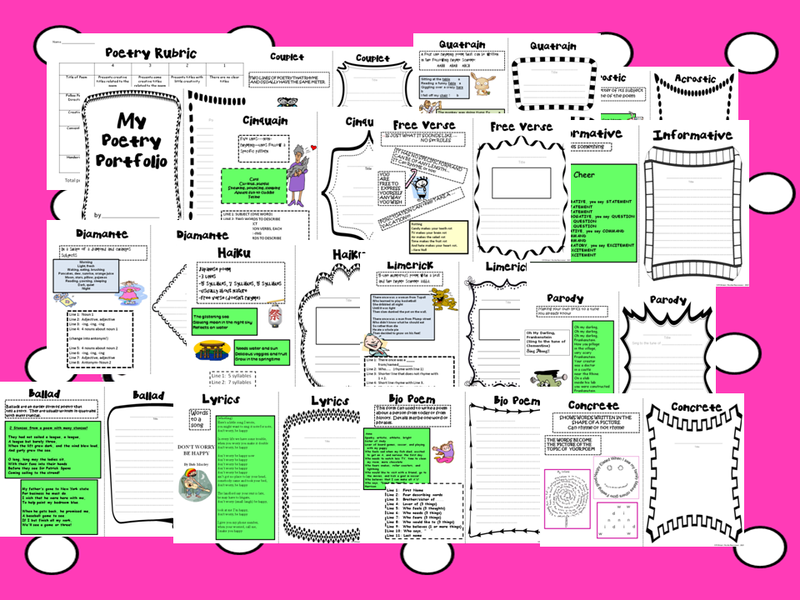 It can be printed and put together as a whole sheet or students can cut along the line to create a half-size booklet and keep the instruction page in their writing notebook. I would staple at the top for the 1/2 size. Another idea is to cut and paste them into a booklet made out of construction paper where both sides can be used. I didn’t create page numbers on purpose. I want my students to create them along with a Table of Contents. This also allows other teachers to pick and choose the poems for their class. I will have students write rough drafts and revisions in their writer’s notebook and final copies onto the booklet. I included a rubric too! Poems included: Acrostic, Couplet, Quatrain, Cinquain, Diamante, Haiku, Limerick, Ballad, Parody, Lyrics, Bio Poem, Concrete, Free Verse, Informative.